With four gins and complementary tonics our Flavoured Gin Gift Set is the perfect choice for the adventurous gin lover. 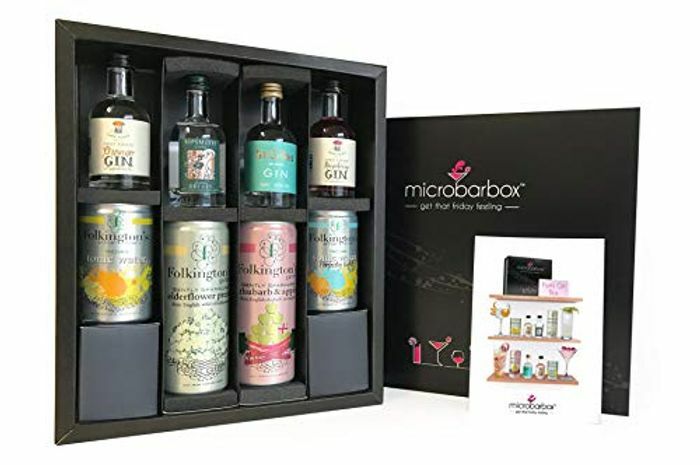 We've taken the classic G&T, added a MicroBarBox twist, and assembled four serving suggestions with pictorial instructions, all in one ready to go box. Box contents: 50ml Sipsmith London Dry Gin, 50ml St Giles Gin, 50ml Sweet Potato Orange Gin Liqueur, 50ml Sweet Potato Raspberry Gin Liqueur, 250ml Folkington's Elderflower Pressé, 250ml Folkington's Rhubarb and Apple Pressé, 150ml Folkington's Indian tonic water, 150ml Folkington's Perfectly light tonic water. The Flavoured Gin Gift Set contains 7 units of alcohol. We have 69,386 Amazon deals and 758 Amazon discount codes on Latest Deals.